March 16th is Fresh Food Donation Station day at Riley Park Farmers Market. Please consider donating a fresh food item on this day to Little Mountain-Riley Park Neighbourhood Food Network for their community food programs. What is the Fresh Food Donation Station? 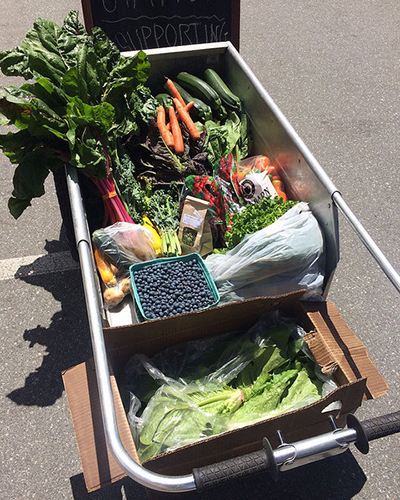 The Fresh Food Donation Station is a program of Vancouver Farmers Markets that collects fruits and vegetables, nuts, eggs, and other food items at our farmers markets for distribution to food programs in the community. Partners include inner-city schools, hospices, women’s and seniors’ centres, and neighbourhood food networks. How do I support the Donation Station? Donate items purchased at the market, or give Market Money or monetary donations that can be used to purchase additional items at the end of the market day. Tip: Look for the Donation Station booth at the market and make sure to ask if there are any specific items needed by our community partners, such as fresh fruit or eggs. Newcomers Community Kitchen – a weekly multicultural cooking, eating, sharing food program for newcomers to Canada. Syrian Community Kitchen: – a monthly drop in kitchen for Syrian immigrants that provides an opportunity to cook together, learn more about available produce, socialize and increase English language skills. Exploring New Foods: – a kitchen workshop that teaches participants how to make a healthy meal, which includes a “take home” bag of food to replicate the meal at home. Participants to this program include recently settled refugees, and low income seniors and individuals in the community. Exploring New Foods is a pilot project funded by Vancouver Coastal Health. Souper – Soup Club: a weekly program that prepares nutritious soups to share with families with young children. Through this program, different vegetables, herbs, spices, legumes and grains are used to show parents different ways to make simple, inexpensive and tasty soups even kids will like. Community Kitchen: a monthly program for parents with young children to cook together in the Community Kitchen while their children are child-minded. As a group, the facilitator and parents plan, budget, shop and cook a 3 course healthy and nutritious meal to take home for their family.